This page covers 5G NR PRACH function, 5G NR PRACH contents, mapping and physical layer processing of 5G NR PRACH (Physical Random Access Channel). • PRACH is used to carry random access preamble from UE towards gNB (i.e. 5G NR base station). • It helps gNB to adjust uplink timings of the UE in addition to other parameters. • Zadoff chu sequences are used to generate 5G NR random access preamble similar to LTE technology. 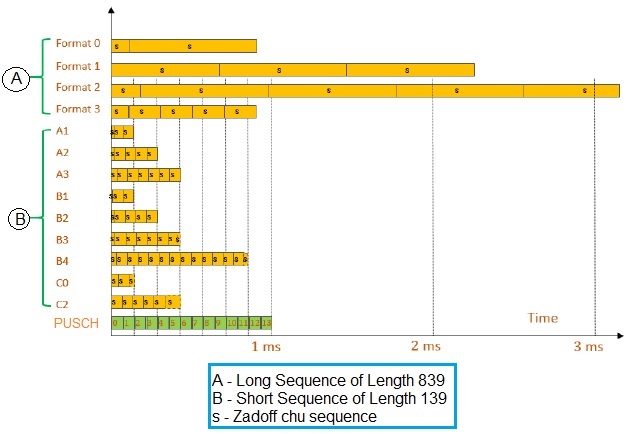 • Unlike LTE, 5G NR random access preamble supports two different sequence lengths with various format configurations as shown in the figure. The different formats help in wide deployment scenarios. The 839 long sequence uses four preamble formats like LTE. These formats are designed for large cell deployment in FR1 (Sub-6 GHz range). They use subcarrier spacing of 1.25 KHz or 5 KHz. The 139 short sequence uses nine preamble formats. These formats are designed for small cell deployment including indoor coverage. These preamble formats are used for both FR1 (sub-6 GHz) and FR2 (mmwave) ranges. In FR1, it supports 15 or 30 KHz where as in FR2, it supports 60 or 120 KHz. subcarrier spacing. • PRACH uses same FFT as used for data. • OFDM baseband signal generation for PRACH is defined in 3GPP TS 38.211 section 5.3.2. • Engineers often come across situations (test cases) in which UE does not receive response from gNB for the PRACH message transmitted by it. During such scenario, they need to analyze the test case with respect to various layers such as radio link, physical layer (L1) and last upper layer messages. This helps them find root cause of the problem.